This page is designed as a photo diary of the development of our new house. Updates may be often, or sporadic, depending on time, rate of progress, etc. 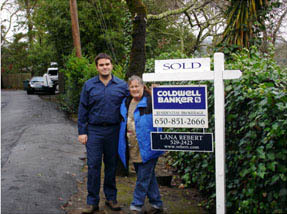 1/6/05: After weeks of digging through inspection reports and disclosures and touring house after house, my mom and I put a bid down on a property in Los Trancos Woods, and it was accepted. The property is located on a hillside in Los Trancos Woods (on the edge of Portola Valley, and runs from the upper (one-way) part of Los Trancos Rd down to the lower (two-way) part of Los Trancos Rd. It is a stepped 3 story house; Master bedroom on the ground floor, entry, entry bath, office, dining room, kitchen, great room, and balcony on the main floor, 2 bedrooms and bath on the upper floor. There is also a basement below the garage, as well as a deck and jacuzzi off the master bedroom.